For generations, folks in Sodus Point have been talking about underground tunnels that were used to transport fugitive slaves from safe houses to waiting boats that then transported them to freedom in Canada. Fran Button Davis grew up in Sodus Point and is a direct descendant of Captain William Wickham. She told us that in the 1930s, her father told stories of a slave tunnel under Silver Waters and was used by runaway slaves as part of the Underground Railroad in Sodus Point. I first became aware of these stories in 2012, as we were putting the finishing touches on our mural commemorating Captain George Garlock and his ship “Free Trader” which carried these freedom seekers from Sodus Point to Canada. When I first heard the stories, I was very skeptical. A tunnel that connected from Sodus Bay through Silver Waters Bed and Breakfast to Lake Ontario? Such a tunnel would be at least 1200 feet long. Why on Earth would anyone go to all that effort to build such a tunnel when you could just bundle them up under cover of darkness to an awaiting ship. The second tunnel reported to exist at Maxwell Creek Bed and Breakfast was only about 100 feet long and seemed much more plausible. It would act as an “escape hatch” for secret entry and exit into the house from nearby Maxwell Creek. told, were covered with a tarp and rowed out to the schooner in a rowboat. This was necessary because sometimes bounty hunters were said to be present at the ore dock in Sodus Point where the schooners left. More information came from stories concerning putting in the sewer lines in Sodus Point in 1976. Three individuals told of cutting across what appeared to be an underground tunnel in several locations on John Street and the other side of Silver Waters B&B going toward the Bay. One of the individuals told of holding up the sewer construction for a day while he excavated in the collapsed remnants of a tunnel and retrieved a number of artifacts. During further research yet another individual told a story that a tunnel existed in their house and was later blocked when a renter went inside it without their permission. With all this information, I was able to establish a fairly accurate hypothetical path for the two tunnels. I soon realized that about the only feasible way to confirm or debunk these stories was using Ground Penetrating Radar. With such a device you could get an image of what was underground. I contacted Dr. Larry Brown who is a Professor in Geophysics and Chair of Earth and Atmospheric Sciences at Cornell University. 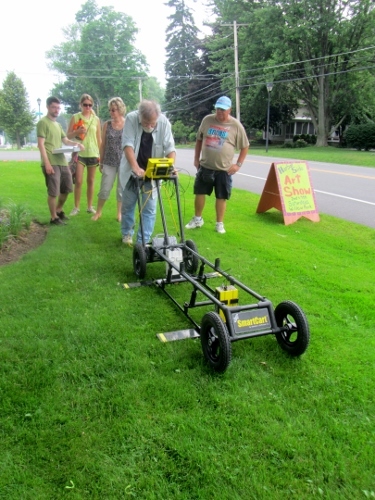 He agreed to bring a team up to Sodus Point and look for tunnels on Tuesday, July 9th, 2013. The day started out in a very exciting fashion. The people who owned the house that contained the remnant of a tunnel invited my wife and I to look at the tunnel. When they told me it had been blocked, I had assumed it had been cemented over. Not so! When we got there, the tunnel surprised me. See picture below. The tunnel was approx. 34 inches wide and 40 inches high and about 21 feet long. 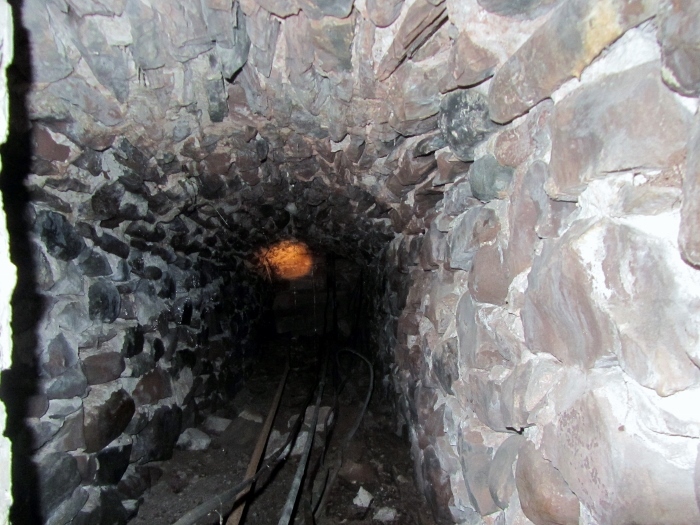 The tunnel ended where it was blocked off by being filled in by large blocks and stones. The ground was dirt but the arch was completely reinforced with rocks. The rock walls and arches were 1.5 feet thick! Would the entire tunnel be like this? Maybe or maybe not. The ground in this location was very sandy whereas along most of the rest of the hypothetical path, the ground is mostly clay and is very solid. A person would need to crawl along this tunnel or if they were short might be able to crab walk. We then went to Silver Waters B&B and waited for the Cornell team to arrive. We viewed some of the artifacts that were recovered in 1976 during the excavation. See Picture below. 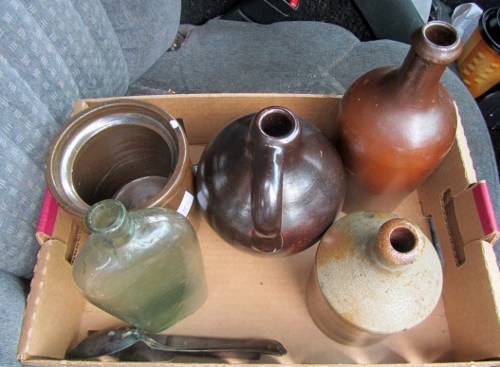 These items included crockery, jugs, a pontil bottle and a knife and spoon. These items appeared to be from the 1800s. At 11:30 AM, the group from Cornell arrived. We learned that they were bringing 2 Ground Penetrating Radar devices. Unfortunately, the second more powerful device would arrive about 1.5 hours later because it was realized on the way up that a needed antenna was forgotten. 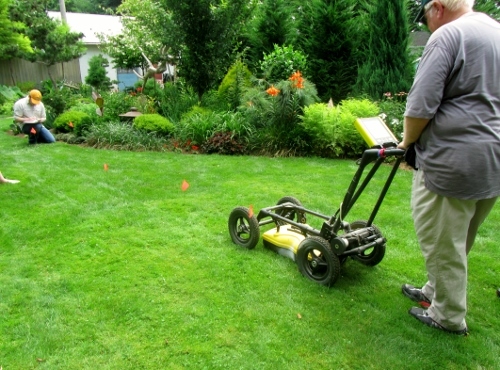 We began searching behind Silver Waters using the less powerful GPR (named Volkswagen). See Picture below. Some hints of possible areas of interest were discovered but two things became quickly apparent. First the process was very time consuming and required a grid pattern for the search to build up an image. The second thing was that Volkswagen was not powerful enough to penetrate more than perhaps 2 -3 feet underground with the clay soil in this area. We believe a tunnel would have been somewhat deeper. 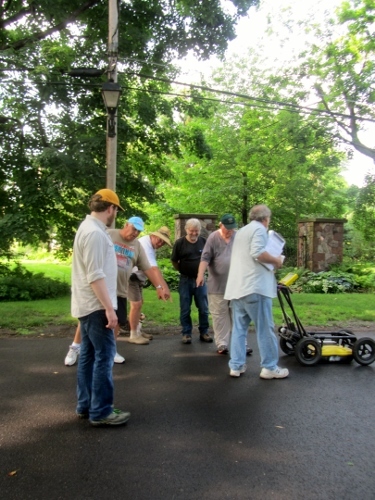 At 1 PM, Professor Larry Brown arrived with the more powerful GPR unit (named Cadillac). This unit used a lower frequency and a more powerful antennae and can penetrate up to 30 feet underground. He started searching in front of Silver Waters (see picture below) doing the now familiar grid pattern. After two runs he had detected something in front of Silver Waters but wanted to do a third run near the road to eliminate roots from a nearby tree. As he got Cadillac in position to do a third pass, the monsoon rains came. After about a half hour of heavy rains, we were ready to continue. It was then discovered that the rain had shorted out Cadillac. Efforts to dry and revive the unit failed. With a growing sense of frustration, it appeared that the tunnels of Sodus Point would not easily give up their secrets. It was decided to soldier on with Volkswagen, although by then most of us were not optimistic. We started on the grounds beyond where Wickham Blvd and John Street meet. Again, hints of something appeared on the ground searched but nothing was definitive. As a last ditch attempt, it was decide to go across John Street pavement where remnants of the tunnel was reported to have been found in 1976. Surprisingly, the pavement seemed to improve the depth that it could see underground. On the east side of the street we could clearly see the sewer line put there in 1976. On the west side of the street we could see what appeared to be water lines going to the houses. But suddenly we began to see something under the middle of the street that clearly did not belong there. It was about 3 feet under the road. It was about a meter wide and a little over a meter tall. It had almost identical dimensions of the tunnel we saw that morning and lined up with it! We ran about 8 cross sections along different parts of John Street and the cavity showed up each time in the same place near the center of the street! See picture below. As we approached where John Street and Bay Street meet, the image became all jumbled up like the ground had been greatly disturbed which perhaps it had been. By now it was 6:30 PM and we quickly packed up Volkswagen and headed for Maxwell Creek. Volkswagen once more started its grid line search pattern. On its 3rd pass, it found something that could be a tunnel near the location where we believe it would have been. More passes were needed to confirm. Once more the Gods of Misfortune appeared in the form of a downpour and we had to end the search. So where does this leave us? We have good evidence of a tunnel running down John Street and a possible something at Maxwell Creek. My frustration at the rain turned to hope when Professor Larry Brown told me “the evidence is definitive enough that I want to come back here in the Fall with my class and continue the search”. Stay tuned, this story is not over yet!